When iMovie first came out for the iPhone and later the iPod touch, it was a revelation: in the palm of your hand was an app that let you edit video, complete with soundtrack, titles and transitions. Of course it didn't hold a candle to what iMovie can achieve on your Mac, but then again, you can't carry your Mac in your back pocket. With the release of the iPad 2, Apple bumped the version up to 1.2 and made the program 'Universal', meaning it now works with the iPhone 4, fourth-generation iPod touch and iPad 2. The first iPad isn't officially supported. So what does this new version have to offer? Aside from the old-style movie theatre look, the first screen is where you can finally rename your projects. The export feature is accessed through here too and you can upload your work directly to YouTube, Facebook, Vimeo and CNN iReport. It's in the main editing section that most of the changes have been made though. In landscape view on your iPad, your camera roll is displayed top-left of the screen. You're no longer forced to add an entire clip to your project, since you can now specify which part you need straight from there. An orange line above sections of your clips shows you which ones you've already used in your project. In the portrait orientation, the Camera Roll is available as a pop-over window but all the features remain the same. The audio tools have been greatly improved: you can now alter the volume of each clip (you still can't vary that volume within the clip) and you can work with up to three layers of audio in addition to the background music and your clips' own audio tracks. You can record a voiceover straight from iMovie and you also have a handful of sound effects to choose from. Although the background music can now be trimmed, it still has to start at the beginning of your project. You have a choice of three new themes, bringing the total to eight. Each comes with its own transition to add in between clips, or you can use a basic cross-dissolve instead if you prefer, so nothing's changed there. One useful addition is the ability to rotate your footage. You also have access to a Precision Editor to fine-tune your edit points, in a manner very similar to the same feature in iMovie for your Mac. Although your projects aren't compatible with iMovie on your Mac, it's possible to transfer them to another iOS device (you could start editing on your iPhone and finish it on your iPad), but the process is incredibly cumbersome since it only works via iTunes on your computer. You can, however, transfer your clips using Apple's Camera Connection Kit, so you could shoot on one device and edit on another. On your iPhone or iPod touch, you have the new camera roll browser, and you can work with multiple audio layers, but you can't trim your audio tracks nor do you have access to the Precision Editor. 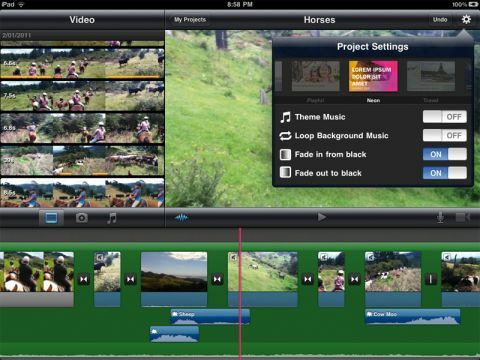 This new version of iMovie has a few useful features that will make editing much more enjoyable on your iOS device. It needs more transitions, title options and effects, but it's still a fantastic app for editing anywhere.